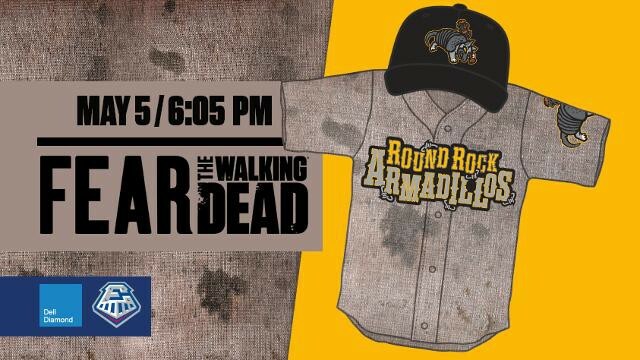 On Saturday, May 5, one of the primary filming locations from Season 4 of Fear the Walking Dead will be transformed from the Round Rock Express into the Round Rock Armadillos! The Express hosted the AMC production from November 2017 to early March 2018. The stadium was reconstructed as a post-apocalyptic home of the fictional Round Rock Armadillos. During initial pre-production phases, we worked alongside the Austin Film Commission to conduct preliminary location scouting efforts and facilitate introductory discussions between AMC executives and Round Rock Express management. VIDEO: Making of the Baseball Stadium: Fear the Walking Dead: Season 4, Episode 2 Behind-the-Scenes. "To have the entire ballpark transform into a television set for several months, then be ready to go for Opening Day is a testament to the great staff we have here with the Round Rock Express," said Express President Chris Almendarez. "We are excited to bring an international spotlight to the City of Round Rock and show the world all that Central Texas has to offer." How can your city host a potential production? We offer a variety of programs and services available to help your community prepare to host productions of all types. Film Friendly Texas Program | FFTX certified communities like Round Rock are better-prepared to meet the opportunities and challenges of media productions. Community contacts can help match local businesses like the Round Rock Express with production-related needs and services. Small Business Owners in Texas | View resources available to help the small business owners in your community. Submit Your Property | The Texas Film Commission receives location requests of all types, from baseball stadiums to ranches and more. If you own or manage a property in Texas, submit to our digital database so your location can be an option for Texas filmmakers. Economic Impact | View other examples of how production has impacted Texas communities. on new episodes of Fear the Walking Dead on Sundays at 9/8 p.m. CT on AMC.